The AT-216 system functions as a remote microphone for the user, overcoming the greatest listening problems for those with impaired hearing: high levels of background noise, reverberation effects, and distance between the speaker and listener. In addition to hearing aids, the user wears the personal receiver and neck-loop. 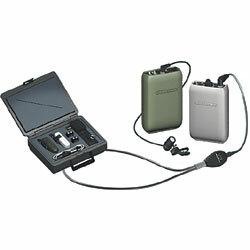 The PR-216 personal receiver picks up the voice of the person wearing the M-216 transmitter, and the neck-loop then retransmits it to hearing aids with a T switch (telecoil pick-up) for close-up sound. If hearing aids are not used, the receiver may also be used with headphones in place of the neck-loop. Now the person with impaired hearing has a direct link to the speaker at greater distances for improved listening, clarity, and better understanding. System includes: One M-216 wireless microphone transmitter, one SM-183 omnidirectional lapel microphone, one PR-216 personal receiver, one NTC-102 neck-loop transductor, one SM-N earphone assembly, one NBC 9-2C battery charger, two Ni-MH rechargeable batteries, one CB-36 ST auxiliary audio input cable, one FWA-216 flexible whip antenna, one TM-10 conference table microphone adapter and one C-216 carrying case.